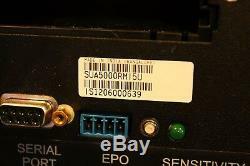 SUA5000rmi5u - no front plastic. New cells installed by us. This unit has no front plastic. This is a perennial problem for us - a lot of the UPS we get do not have the front plastic parts as they are easy to detach and become separated from the UPS. The good news is that if you don't mind the cosmetics as the UPS is in a cupboard or agricultural site then you can get a decent discount. We come up with a solution - you can see it in these photos - a smaller control panel plastic is attached to the front of the UPS with cable ties. The UPS works exactly as a unit with the front plastic. The difference is cosmetic only. This type is designed to be hard wired, but we can help. We have lots of spare cables in stock and if you let us know what you need for your site we can see if we have one of those to wire on. We have many cables here if you let us know what you need when ordering we'll do our best to match that (FOC if a cut off we have, or at cost if we need to order parts), or can simply put a normal UK plug on so you can quickly test the unit when it is delivered. 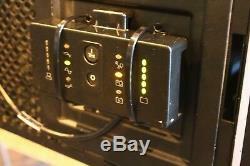 The UK plugs are 13 A limited, whereas these UPS can draw more current than 13 Amps. 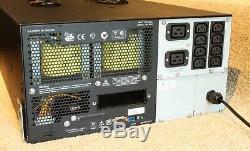 The UPS max current associated with its peak VA power is more like 40 Amps. I have taken a picture of the wiring port so you can see what to expect. The UPS has been thoroughly tested, and comes with brand new cells so you can expect it to work long term. The nominal SLA cell life that we are seeing from repeat business from customers is between 3 and 7 years depending on the use profile and installation site temperature (cooler is better for SLA cells). Our units are refurbished but will perform the same. They are cheaper and will have signs of previous use (painting touched up or resprayed where needed). As the cells are new the power support runtimes will be the same as a new UPS from APC. 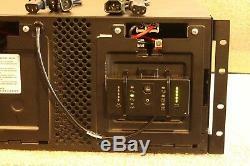 It can be used as a rackmount unit or a tower. Likewise with network cards - we have a range and can quote the options. 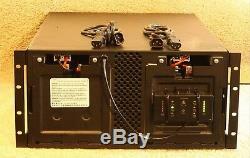 They are a heavy duty UPS with a well designed internal layout (for cooling). They have a fan that is on all of the time. All up weight with the cells installed is around 100KG. Under normal circumstances orders before 3PM are dispatched on the day of order. Large units / quantities may roll over to being dispatched the next day. We try to meet all customer deadlines. All of our consignments are sent fully insured on a 24 hour service with our carriers. We cover all problems that occur in transit. We have the packing materials to make sure that there are no problems in transit. Our warehouse is based in the UK. Output power capacity 4.0 KWatts / 5.0 kVA Nominal Output Voltage 230V Output Voltage Note Configurable for 220 : 230 or 240 nominal output voltage Efficiency at Full Load 96.0 % Output Voltage Distortion Less than 5% at full load Output Frequency (sync to mains) 47 - 53 Hz for 50 Hz nominal Other Output Voltages 220, 240 Topology Line Interactive Waveform type Sine wave Nominal Input Voltage 230V Input frequency 50/60 Hz +/- 3 Hz (auto sensing)Input Connections Hard Wire 3-wire Input voltage range for main operations 160 - 286V Input voltage adjustable range for mains operation 151 - 302V Efficiency at Full Load 96.0 % 2x RBC55 cells (new) Operating Temperature 0 - 40 °C Audible noise at 1 meter from surface of unit 53.0dBA Online thermal dissipation 430.0BTU/hr Maximum Height 222mm , 22.2CM Maximum Width 483mm , 48.3CM Maximum Depth 660mm , 66.0CM Rack Height 5U (or can be used as a tower) Net Weight 97.73KG. 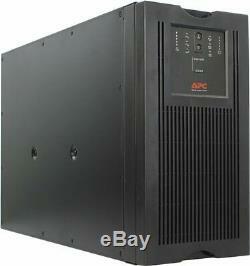 The item "APC SUA5000rmi5u 5000VA / 4000W new cells 12m RTB warranty no front" is in sale since Monday, October 23, 2017.